This posted started out asking you to wait before upgrading to FileMaker Pro 16. But we’ve investigated further and we think you can safely upgrade. All the normal cautions about making a backup first and testing your version of Studio Manager with FileMaker Pro 16 before going live in your shop still apply. And we even have a tip for you to make sure the FileMaker 16 bug we were concerned about is not possible in your version of Studio Manager. Upon further investigation including testing Studio Manager 8 and Studio Manager 15 and using our Filemaker analysis tools, we think you can safely upgrade to FileMaker Pro 16 at this time and not worry about the bug in deleting from portals that we discuss below the horizontal line. There is a bug described but it doesn’t match up to our implementation methods for deleting portal rows. Our method works anyway and doesn’t trigger the bug. If you’ve hired a FileMaker expert or have your own in-house expert who has added features to Studio Manager that include deleting portal rows with scripts, they need to read the FileMaker article (link) to make sure you are not going to have a problem with this change in the way FileMaker 16 works when it comes to deleting portal rows. He or she should determine if you need more testing than what I’ve described below. Just to exercise an abundance of caution, if you upgrade to FileMaker 16, we do recommend that you do a test estimate and try deleting estimate line items from Services, Expenses and Flat Fee Expenses (added in Studio Manager 11) using the delete buttons in the portal rows. Estimates is the only place in Studio Manager we could find that could possibly set off this new bug. Don’t hesitate to contact us if you have any concerns at all about this! Janet will be happy to answer your questions. 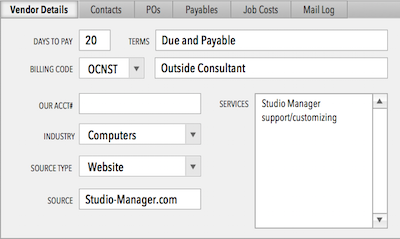 There is a bug in FileMaker 16 that I am needing to make sure doesn’t affect your copy of Studio Manager. This is a more serious bug than typical but not at all at the catastrophic level. But it could be problematic if Murphy’s law happens just so. In testing to see if this is an issue for Studio Manager, I haven’t been able to replicate the bug even by trying to make Studio Manager 15 fall into the trap I’ve read about. So, I’ll keep researching to see exactly what the vulnerability is. The help from filemaker in their Knowledgebase article says that the first portal on the layout by creation order has to have some records and the portal you are trying to delete from has to have zero records. Also, the bug doesn’t occur if you can add records to the portal by typing into the bottom row. Technically: If there is a Go to Object script step that is addressed to a portal (which is considered an object in FileMaker) and it is followed by a delete portal row script step, things can go awry if the Go to Object name and the Portal names don’t match. FileMaker 16 unlike previous versions of FileMaker, will default to the first portal created on the layout and delete from the wrong portal. In Studio Manager of recent vintage, that means you could be on the expenses or Add Item tabs deleting a line item there you think but end up deleting a services line item inadvertently. Not good! Non-technically: Worst case, you could be trying to delete an estimate expense line item and wind up having a services line item delete without noticing it at the time. You would just see that the expense item didn’t delete and perhaps try again, deleting a second services line item. I am concerned that some release somewhere of Studio Manager since FileMaker 8.5 when the Go to Object command was first made available, might have a discrepancy between the name of the Estimates portals and the name in the script. If you are running versions prior to FileMaker 15, this bug is not present. We think FileMaker Inc. will fix this in its first update to FileMaker 16. That’s not out yet as of June 20, 2017. So, like I said above, don’t upgrade to FileMaker Pro 16 quite yet if you are using Studio Manager especially versions before 15. Feel free to contact me for free support on this if you’ve already upgraded to FMP16. If you are setup to allow remote filemaker users or you have a way for me to screen share from a user machine, I could login and check to see if you are vulnerable to this issue. An even more thorough method would be for you to give me a download link for a backup of your Studio Manager file or even better, to make an empty clone of your copy of Studio Manager with the File/Save a copy as… command so I can check that for you. Previous post: Our Main Phone line is now an iPhone!